Ultraroof- lightweight solid roof perfect for replacing an old tired conservatory roof. In July Ultraframe are launching their first lightweight solid roof with a choice of 3 authentic slate tiled colour options to match or co-ordinate with most U.K. homes. The new roof is lightweight enough to replace an old tired less fuel efficient conservatory roof which will give the look and feel of an extension. We also offer the option of rectangular glazed panels into the roof so your room can still be flooded with light. The use of energy efficient glass into the tiled roof will keep the room cooler in the summer and warmer in winter and enable you to use the room all year round. Internally, we offer a beautiful vaulted plastered ceiling which provides a light spacious feel to the room with a stepped pelmet at the eaves which allows you to incorporate down lighters to give that contemporary orangery feel. The roof is quick to install so from the removal of your old roof to the installation of your new Ultraroof you can be watertight in the same day. 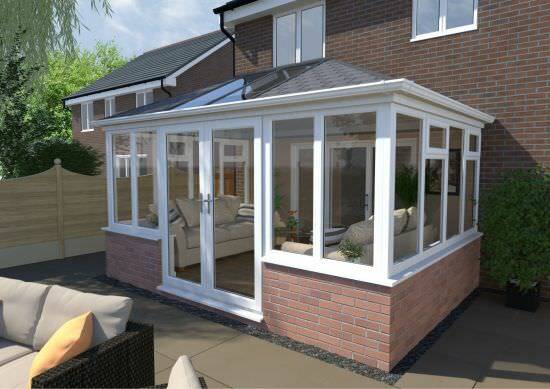 So, if you want an energy efficient roof, with the look and feel of an extension, then why not discuss this option with your local retailer and breathe new life into a tired conservatory.